River house loosely and lightly scattered like stones in the wooded site. 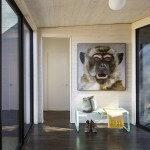 Residence removes themselves from city life，feels the changing of the seasons. The James River House was designed as a place for three young boys. It is a place where they could grow and learn from their surroundings – experience mud, moths, flowing water, and the changing light of the seasons; a place that would allow for many gatherings of all those who love them. 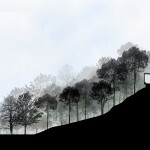 Three volumes hover above a bluff alongside a bend in the James River, arranged loosely and lightly on the land like a scattered group of stones around a campfire. 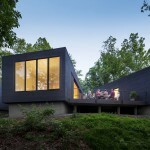 The James River House is a riverside retreat. 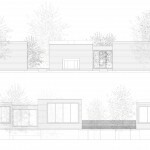 There is an almost 1/2 mile long drive through the wooded site before arriving at the studio/garage, where visitors leave their cars and walk to the house, providing a feeling of hiking into the house and slowly removing them from city life. 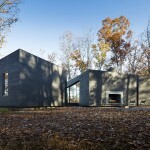 The house itself is a collection of three distinct volumes，the three volumes of the house hover above a bluff alongside a bend in the James River, arranged loosely and lightly on the land like a scattered group of stones around a campfire. 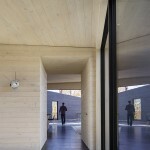 The arrangement of these volumes allows the visitor to slip between and through the house, opening the view to reveal light, river, and the woods. Due to the strategic placement of glazing, the house has a distinct front and back side, with large windows facing the river to the North, and an opaque, sheltered side facing the South. 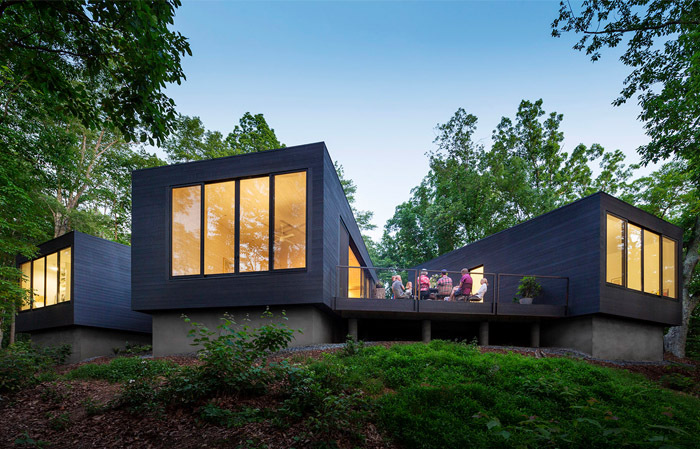 The volumes are angled away from each other on the Northern side so that the residents are provided with several different views of the James River, as well as the surrounding and enveloping canopy of trees. The three distinct volumes, each serving its own function. 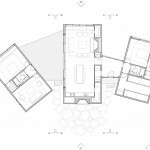 The kitchen and the living room occupies the central volume, while the attached structure houses a bedroom for the parents, as well as a bedroom for the kids with eight built-in beds for the boys and their friends. The quiet yet open interior is built around a large and flexible gathering space that can be intimate, expansive, interior, or exterior. Flanked by sleeping quarters, this central living area is at once hearth, tree house, and dining hall and is the nexus of activity for the family and the three boys who fill the house with light and motion. 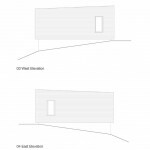 This design also allows the opposite side to angle inward, reinforcing the sheltered atmosphere of the South elevation and the outdoor hearth. The third volume, dedicated to guests, is detached from the main volume, yet is connected with a deck, where guests and family can enjoy good weather and take in the cycles of the seasons tucked into the canopy of the surrounding trees.